Something Great Happening in Washington DC! I hope each of you had an amazing Resurrection Sunday Celebration, otherwise known as Easter. If you happen to be among the percentage of American’s who don’t celebrate any portion of the Judeo-Christian history celebrated this past week, I at least hope you had a great day of rest! Both of our church services were overflowing with people. It literally was standing room only all the way back in the atrium, outside the sanctuary, likely with many folks who attend services twice a year – Christmas and Resurrection Sunday. That is a great thing! That got me to thinking – each of my writings thus far has talked about virtues. Most of my writings have said critical things about Washington, DC. Indeed, my March 2 editorial referred to Washington as Rome, being under massive construction – while burning at the same time! My March 9 editorial shared my belief that the most critical issues we face are “non-respecter of person” issues, which I would be writing more about in the future. This week, I want to share with you a building under construction in Washington, scheduled to open in November 2017, which I believe will have a profound impact on our republic, indeed our world. The Museum of the Bible will be located two blocks south of the Smithsonian Air and Space Museum and 4 blocks SW of our Nations’ Capitol Building. Through a series of events, on March 15, 2016 I had the privilege of touring the construction site of this incredible undertaking. Pictured above, after climbing to the future top floor is my oldest son Robert, his new bride Brittany, my parents Hank and Bobbye and me. You can see the proximity of the future Museum to the capitol in the photo. 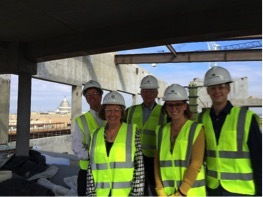 The top floor will be glass enclosed, providing amazing views of our nations’ capitol. “The Bible ought to be a part of our education, because of its literary culture. There are countless phrases in our culture, that come from this book.” Richard Dawkins, world famous atheist, and author of the book The God Delusion. “We just want to be honest brokers of the information. We’re just wanting to present the facts and let the people make their own decisions. We don’t want to embellish anything; we don’t want to be negative either.” Steve Green, President of Hobby Lobby and Chairman of the Museum of the Bible. Personally – I believe this book points to the virtues required for a civil society, regardless of one’s faith tradition. Today we are likely the least educated generation in our nation’s history on its subject matter, and this museum will help improve that situation. For more information, I recommend listening to the interview conducted by Family Life Today, and Steve Green, Chairman of The Museum of the Bible. That interview can be found at http://familylifetoday.com/program/the-bible-a-story-worth-telling/. The museum website is https://www.museumofthebible.org/. 2 Responses to "Something Great Happening in Washington DC!"